The magnanimous Arab world, spreading across the Middle East and northern Africa, enwraps rich Arabic culture and tradition. The nuances of every Arab city and intricacies of its heritage, make it worth experiencing the myriad hues of Arabic culture, cuisine, arts and music, and entertainment. However, these five destinations are most famous with travellers thronging these cities all year round! Arabs are sure to find their sojourn in these five cities which entice with the warm hospitality of its people. While foreign travellers are left awestruck with the beauty of these places, surely promising to come back! The capital of Lebanon, boasts of amazing coastline, high mountains covered in colourful flowers and greenery all year, making Beirut one of the most beautiful cities in the Arab world. Beirut is a concoction of ancient Arabic culture and modern living, embellished with great eastern cuisine like Tabbouleh, Fattoush and Beiruti style grilled chicken or meat, surely making it an irresistible destination! Dubai is the ultimate destination which brings the best of the world on one platter! It is a blend of diverse cultures and traditions with people from all over the world making Dubai their home. The city boasts of some unique modern architecture, serene beaches, delectable cuisine and lifestyle, and not to forget it is home to world's tallest building The Burj Khalifa! Dubai's modern lifestyle is a fine example of East meeting the West. And with ample amusing activities all year round, it is one destination on everyone's travel wish list! Capital of Egypt, Cairo is the biggest and the oldest city of the Arab world and the Middle East where ancient Arab culture blends with Egyptian lifestyle. Cairo is famous for its art and history which gives glimpses of the old Egyptian world. Travellers can take back with them the essence of the Arabic culture through special movies, songs and theatre, or simply by taking a stroll in the Cairo streets! However, with museums, pyramids, The Saladin Citadel of Cairo, modern day malls, and much more, there is so much to experience in Cairo that a single trip is not enough. A city perched in the Rif Mountains of northwest Morocco, is known for stunning blue-washed buildings which is a small world in itself. 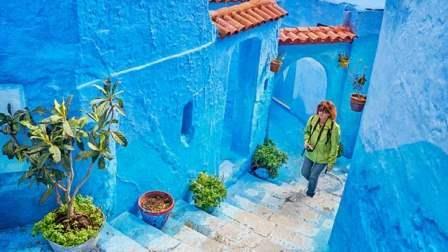 Chefchaouen is the delight of Morocca basking in the glory of cobbled lanes, red-walled Kasbah which is a 15th century fortress, Ethnographic Museum and octagonal minaret of the Great Mosque. The destination is definitely a strong alternative to a tiring multi-city tour as it gives tourists a chance to get lost in its tranquility, cool green hill and beautiful beaches. Salalah is the capital and largest city of the southern Omani province of Dhofar. It is famous for banana plantations, Arabian Sea beaches and the marine life. The Frankincense Land Museum exhibits the city's flourishing maritime history of spice trade. The desert terrain transforms into lush green landscape during the Khareef season which brings rainfall to the region almost everyday. Besides, the Omani people are known for their hospitality and warmth, making it all the more attractive to travel to Salalah.